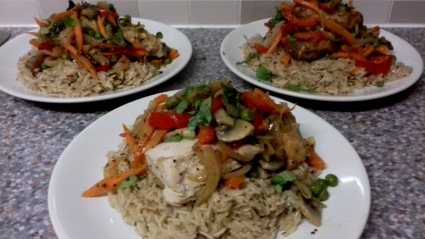 So Poulet Yassa. It's a citrus Chicken dish which we served on a bed of fragrant rice. (1) Spatchcock the Chicken – (Details here) and marinade in all the ingredients except the sliced Onion for at least 4 hours. (2) Cook the Chicken in the oven at 180c for 30 to 40 minutes until the thickest parts run clear which you pierce them. (3) In a pan using the cooked marinade and mean juices fry the Onion for 10 minutes. (4) Add your vegetables. We used Carrots cut into batons, sliced Red Pepper, sliced Mushrooms and Peas. (5) Simmer until the vegetables are tender, but not too soft. (6) Cut the Chicken into large pieces removing all the bones and add to the pan, stirring until heated through.